Airlines have been attempting for decades to significantly improve the boarding process — usually with little to no success — and the main reason for doing so has been to shorten the turnaround time from when an airplane arrives at the gate at the conclusion of one flight to when it departs for the next flight. Theoretically, when the turnaround time is shortened between flights, additional flights can fit into the schedule. More flights per day would therefore supposedly mean more revenue per day for airlines. …but as with Basic Economy airfares, has the focus of airlines been eventually drifting away from expediency and more towards selling passengers up to a better class by “shaming” them? Could glaring reminders to passengers that they could have enjoyed a more premium flight experience or be sold a credit card be more profitable than squeezing more flights into the schedule — especially as the former is significantly easier to implement by the airline due to fewer regulations and expenses? 2013 was a very busy year for the boarding processes of airlines, which seemed to change every month. An unpopular attempt by United Airlines was launched in January of 2013 to simplify and reduce the number of boarding groups, as well as eventually revise the layout of gate areas with premium bypass lanes and improved directional signage. As part of an effort to address crowding and consistency, the way passengers boarded on United Airlines flights had changed — starting by simplifying and reducing the number of boarding groups — as well as eventually revising the layout of gate areas with premium bypass lanes and improved directional signage. The reason for the reduction from seven boarding groups to five boarding groups was to give those passengers assigned to Groups 1 and 2 a less hectic experience overall through the use of dedicated lanes, better signage and bypass opportunities with access at any time. As to why Global Services is listed twice — once for Pre-Boarding and once for Group 1 — passengers who have Global Service elite status will continue to be invited to pre-board, but their boarding passes will be printed with Group 1 in case they arrive after pre-boarding begins. Certain customers with disabilities boarding after everyone else boards to expedite the boarding process if they arrive too late for pre-boarding is understandable; but do military personnel not have a similar invitation? After all, the premium lane acted as a bypass lane for those passengers who arrive at the gate after general boarding has already commenced. 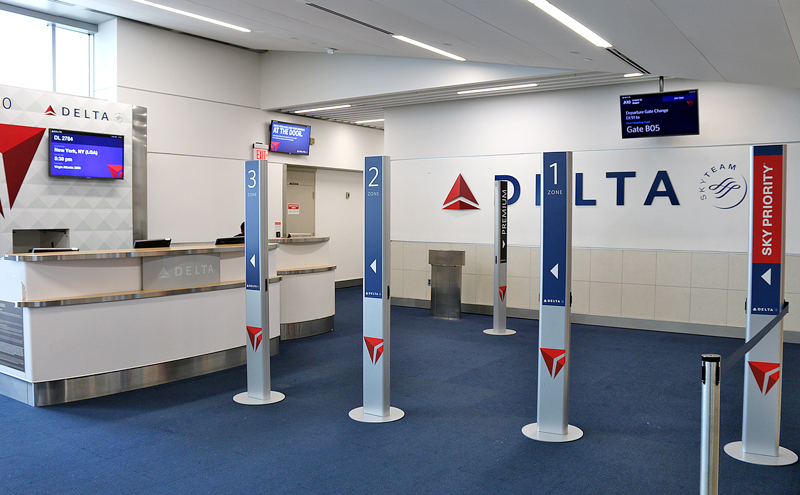 At nearly every gate, Premier Access boarding was comprised of two separate lanes, enabling a dedicated line eachfor groups 1 and 2. American Airlines tested at several airports in March of 2013 a boarding procedure which allowed passengers without any carry-on luggage to board the aircraft early. Personal items — such as purses or computer laptop bags — did not count as carry-on luggage. Also, passengers without carry-on luggage did not get to board before elite members of the American Airlines AAdvantage frequent flier loyalty program. If that procedure was also implemented not only to have fewer pieces of luggage stored overall in the passenger cabins aboard the aircraft, but also as a potential hidden incentive for you to check your luggage would have been no surprise to anyone — which would have meant that you might possibly be required to pay an ancillary fee to check your luggage to experience the privilege of boarding earlier if you were not already an elite level member of the American Airlines AAdvantage frequent flier loyalty program. Of course, you could have opted to pay for the baggage delivery service if you decided to check you luggage — or you could have paid as little as $9.00 to board early and still had your carry-on bag if you did not have elite level status. KLM Royal Dutch Airlines introduced Smart Boarding in November of 2013, which purportedly had significantly reduced the amount of time needed to board passengers onto its airplanes due to less congestion and interference aboard the aircraft. Upon entering the gate area, each passenger scanned his or her boarding pass. The computer provided a number which determined the boarding sequence of passengers. Once boarding of the aircraft had started, the number on the monitor determined which number was called — and only then was the passenger allowed to board. Passengers with SkyPriority status were given low numbers. Within this group of passengers, the lowest numbers were given to frequent flier loyalty program members with elite level status who were assigned seats at the windows towards the back of the airplane; while frequent flier loyalty program members with elite level status who held seat assignments next to the aisle towards the front of the aircraft were given higher numbers within the elite group — similar to the procedure of filling the aircraft with passengers from the back to the front. Passengers who had SkyPriority status were given priority. The system ensured that priority was given to passengers who had earned SkyPriority elite level status so they did not have to wait long before boarding the aircraft. Passengers who traveled on one single passenger name record and seated next to each other were given consecutive numbers. The Smart Boarding procedure was not be used for bus gates. The boarding number was given at the gate in order for employees of KLM Royal Dutch Airlines to know which passengers are already at the gate. Moreover, the later you determined the sequence, the better it is optimized. If the sequence is determined before the first passenger checks in, there would be many passengers who have not selected a seat yet. As a result, the data on many information technology systems worldwide would have to be changed to print a new number on the boarding pass. I do realize that there needs to be some consistency in the boarding process. After all, if an airline can significantly shorten the time between which passengers leave the aircraft from a previous flight and board the aircraft for the next flight, the airline can theoretically add another flight or two in a day, meaning potentially additional revenue — and hopefully, additional profit — while keeping passengers happier. I could be wrong, but the problem in my opinion is that different passengers have different preferences for different reasons. Some passengers prefer to board early for the aforementioned reasons cited — but not all aircraft are equipped with premium class cabins, and not every flight has the exact same services and equipment. Some passengers dislike spending more time on an airplane than necessary and will attempt to board last whenever possible. Some passengers have special requirements — one passenger with an unruly child or another passenger who cannot reach the overhead compartment with that heavy oversized bag is often enough to throw the entire boarding process into chaos. To render consistency in a process with a vehicle generally shaped like a tube — usually with only one opening and a Jetway in which to funnel the masses — is limiting at best. Even an ordinary car has two or more doors used for simultaneous entry and egress, and a bus usually has a minimum of two doors as well. No matter how many times airlines have attempted to resolve the seemingly eternal problem of enhancing the boarding process, the improvements only seem marginal at best. Scientists have even studied the boarding process and attempted to apply algorithms to help implement a solution, but to no avail at this time — or, at least, the findings are not currently being used, for the most part. I would not be surprised if basic human nature was the inhibiting factor, but what do I know? To this day, many passengers wait in line in the jet bridge to board the aircraft — long enough at times that I am surprised that airlines have not considered renting space aboard the jet bridge to third-party merchants with kiosks to sell their wares while passengers wait. Those destination posters currently hanging in the jet bridge have never caused me to think to myself that I must purchase a round-trip ticket to the advertised destination — let alone persuade others to do the same. Attempts to improve the boarding process by expediency have ultimately failed over the years — despite the best efforts by airlines and airport authorities. Not that management of other airlines had not already figured out some years ago that they could sell boarding the airplane early for a fee, has Delta Air Lines waved the white flag and given up on expediency — and instead figured out a way to potentially increase profitability by embracing the opportunity to subliminally sell passengers more expensive products and services through the use of the branded pillar boarding process — and if so, will other airlines follow along to further monetize the boarding process in one form or another? Most airline boarding procedures are a mess. I’m not a fan of Southwest but they have this figured out and have even managed to monetize it. Of course, those passengers are fighting for “festival seating” which is illegal at many concert arena’s but works well for airplanes it seems. Makes me wonder if the other airlines with assigned seating could replicate this to some degree. The priority passenger lane signs and other junk is mostly just in the way when boarding. The boarding groups are a joke and gate lice as well as inexperienced flyers will never let these systems work well for a variety of reasons combined with one of the peak stress points of flying. In addition, it may seem like some are being shamed into buying better tickets or obtaining the credit card when they call out all the boarding groups but there are a lot of elites that are insulted that people obtained the same (or nearly same) boarding group by simply getting a credit card instead of earning the old fashioned way. you are the king of random punctuation. check out the length of this one sentence….or is it a one sentence paragraph?! ha ha!